Add some color to your plate for more beautiful hair! You may have heard that it’s important to eat your yellow and orange fruits and vegetables because they are packed with vitamin A because of the carotenoids they contain. But what the heck is a carotenoid?!? Carotenoids are the colorful plant pigments found in all of the beautiful yellow and orange and red fruits and vegetables and herbs out there. There are over 700 different carotenoids been discovered. They are high in antioxidants, which help the body to get rid of free radicals, fight disease and reverse the signs of aging. Beta-carotene is also known to convert into vitamin A, which is essential for healthy looking skin and hair. Therefore, it is essential that you add carotenoids to your diet in as many ways as possible. Carrots are a great example, as are oranges, berries, nectarines, corn, and sweet peppers, yams and sweet potatoes. Generally, the deeper the color, the higher concentration of carotenoid. I found out that even green leafy vegetables such as spinach, asparagus, and broccoli contain large amounts of carotenoids Their intense green color (the green pigment, courtesy of chlorophyll) masks the tell-tale orange-yellow color. The bright-orange beta-carotene is the most important carotenoid because it yields the most Vitamin A. You can also get carotenoids by eating avocados, cooked tomatoes, in your colorful soups, salads, and stews. Pretty easy when you think of it. 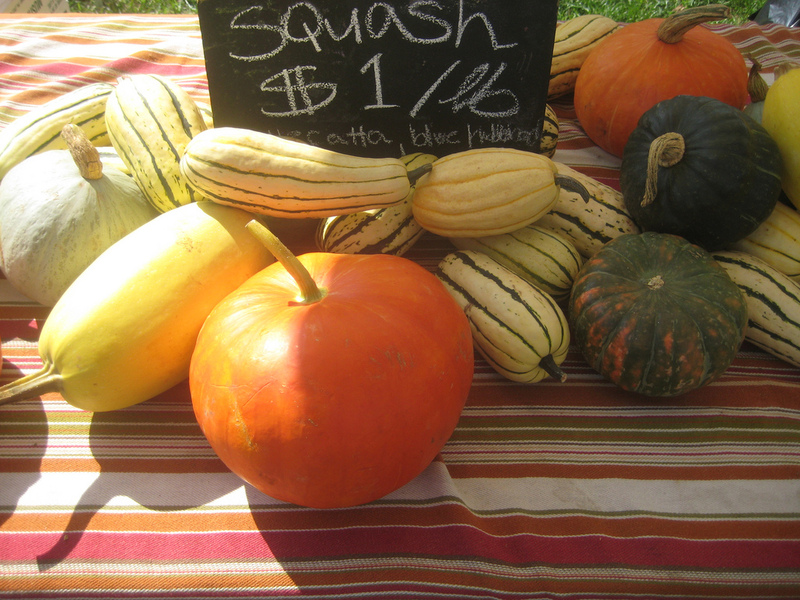 Then let’s not forget our yummy squashes which are also an excellent source of fiber. Deep-colored squashes (including pumpkins) have the most beta carotene and one cup cooked squash is only about 100 calories. Although winter squash has apparently long been recognized as an important food source of carotenoids, only recently have research studies documented that they are packed with these key antioxidants. In fact, winter squash has been reported in several studies to come out as one of the top three food sources for health-supportive carotenoids. I recently came across the Dumpling squash at my local Farmer’s Market. Actually, I had seen them before. 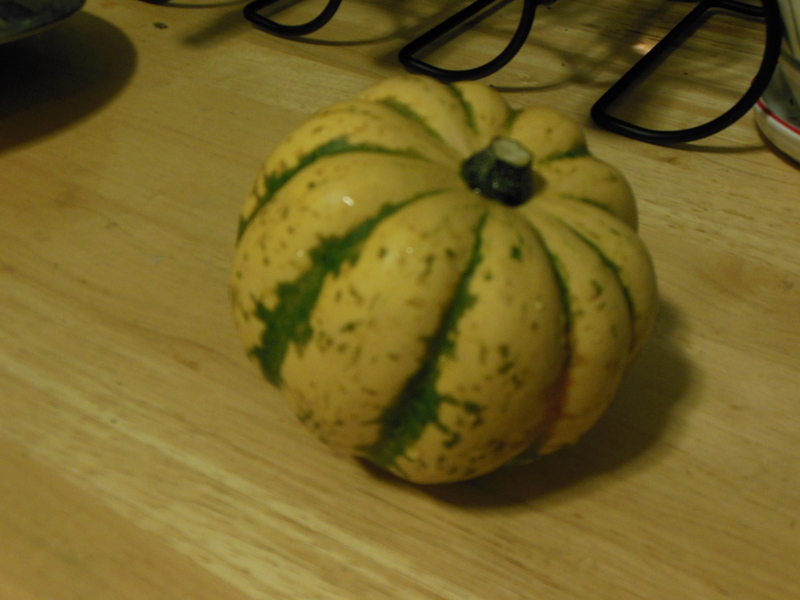 It is a fun, small squash that averages about four inches in diameter, weighs less than a pound, with a creamy white skin with green and yellow markings and bold, scalloped hollow lobes giving it a miniature pumpkin appearance. Well as it turns out, it not only looks great as a table decoration, but it is packed with wonderful nutrients. Once cooked, the tender, orange flesh offers a sweet flavor along the lines of a sweet potato. Because dumpling squash can be difficult to peel, I researched the best way to prepare them and found that they are most often baked or roasted with their skin on. Once cooked they can be cut into chunks, halved and stuffed with grains or other vegetables. I think it would be wonderful to add some baked warm slices to a green salad. Wouldn’t that be beautiful? It can also be pureed and added to rice or soups. Harvested in the fall they can be kept well in a cool area or at room temperature away from direct exposure to light for three to four months The ideal temperature for storing winter squash is between 50-60°F. Check out my recipe section for a simple way to bake this little cutie.